Sometimes, recipes are born out of necessity. Take this one for example: I’ve been on an anti-Candida diet for about 5 months now (it basically involves almost no sugar, no yeast, no refined foods, no alcohol, no fermented foods, very little carbs, no pickles or vinegars etc – no fun!) and although I think I’ve done really well at sticking to it and still feeding myself nourishing and appealing foods, there are times when it’s really hard. Like when it’s Christmas and you just want to bake cookies. As I’ve been reintroducing a small amount of dates back into my diet, I decided now was the time to try and create a Christmas cookie recipe that aligns with my current way of eating, and I’m pretty delighted with the result! 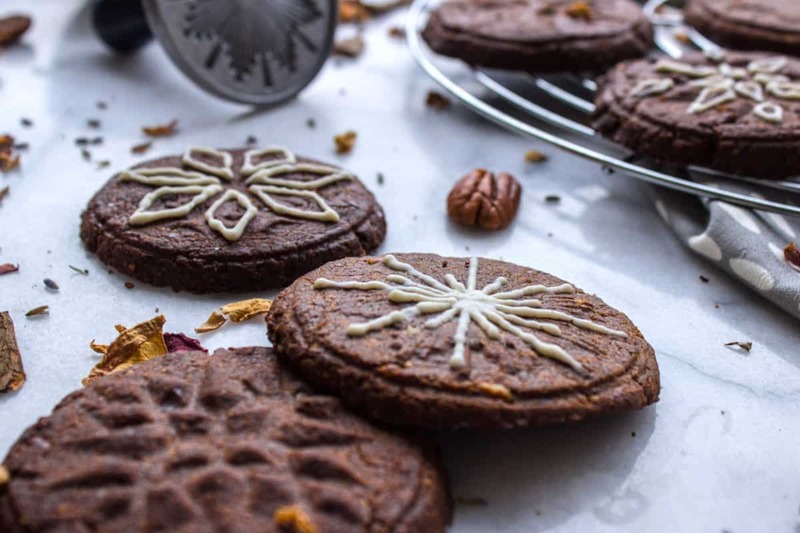 With these Wholesome Holiday Cookies, I’ve managed to create one that not only tastes really good (I may be biased) but is naturally grain-free, low in sugar, gluten-free, high in protein and naturally vegan. I’m all about nutrient-dense ingredients so these cookies contain only whole foods, which are full of nutrients and vitamins, and due to their high protein content they won’t give you a sugar crash! If you’re a fan of soft, rich baked treats with a deep molasses flavour, these Wholesome Holiday Cookies are for you. They don’t taste like shop-bought confections, but they do taste homemade, delicious and full of love. I’m pretty proud of these ones. Merry Christmas! Preheat your oven to 350°F/175°C and line two baking trays with parchment paper. Mix the flax and water in a bowl and set aside. Blend the pecans/almonds in a blender/food processor until they are flour. Add this and all other dry ingredients to a large bowl and mix together. Blend the dates in a high-speed blender/food processor until they are broken down into really small pieces. Rub them into the dry mixture with your hands. Add the coconut oil and flax/water mixture to the dry mixture, and knead until all ingredients are combined and a dough forms. Divide the dough into 12 equal balls, and press them down flat into ½cm circles on the baking trays, equally spaced apart. If you have cookie stamps, press them into each cookie now to make a pattern. Bake the cookies for 13-14 minutes until they are just beginning to brown (they will still be soft), then remove from the oven and leave to rest on the baking tray for 5 minutes. Then transfer to a wire rack to cool. For the optional frosting, heat the coconut butter on your stovetop in a small saucepan on a very low heat, until it becomes runny. Mix in the stevia and cinnamon, and spoon the frosting into an icing bag. Use this to decorate your cookies with festive shapes! Do you struggle with meal planning? Enter your email below to get my free cheatsheet straight to your inbox, as well as exclusive updates, tips and recipes. 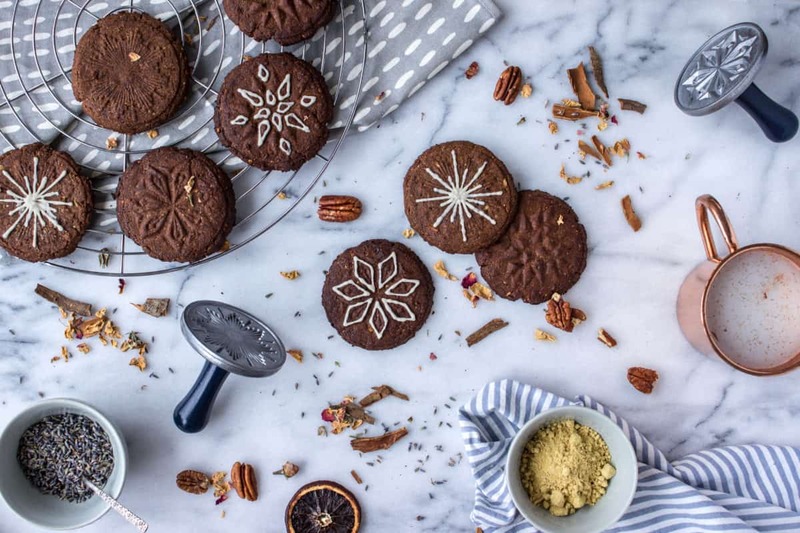 These cookies look gorgeous, I love how you decorated them and the photography is absolutely beautiful! Thanks Nicole! That means so much. 🙂 They were so much fun to make!